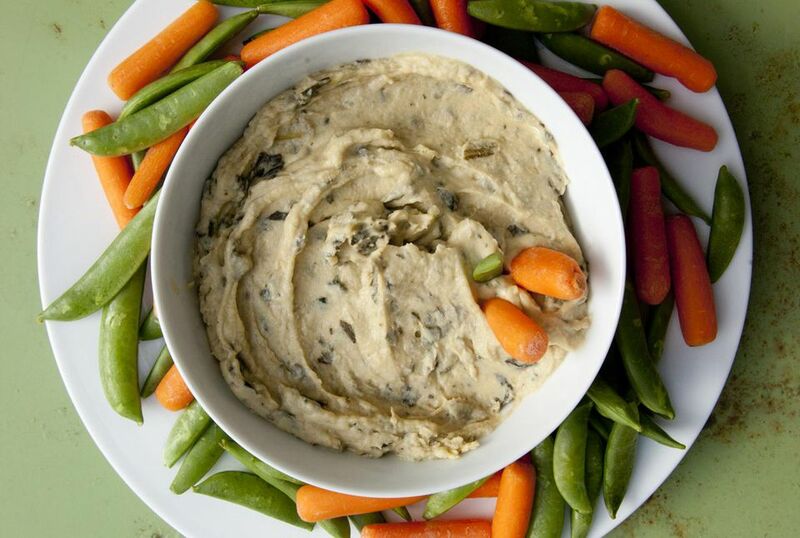 Spinach hummus is a delicious variation on the traditional Middle Eastern hummus recipe. It is quite easy to prepare and sure to be a crowd-pleaser at any dip-lovers gathering. Note that, if the hummus doesn't come out to the consistency you are looking for, just add 1 tablespoon of water at a time until you reach the desired texture which should be smooth and super creamy. Hummus, as a dip, is probably one of the best known Middle Eastern foods. Made from chickpeas (hummus is the Egyptian word for chickpea), you can find ready made versions of it in most supermarkets and grocery stores as well as on the menus of both Middle Eastern and non-Middle Eastern restaurants. Along with the chickpeas, hummus typically includes garlic, lemon juice and tahini (sesame paste) as well as a wide range of potential spices and toppings such as olive oil, chopped tomatoes, roasted chickpeas and toasted pine nuts. But it also lends itself to many types of variations in the base such as making it with white cannellini beans or fava beans instead of chickpeas. Black beans can be used to create a dish similar to a black bean dip, olives add a briny taste and roasted red peppers give hummus a flavorful twist. Although adding spinach to a hummus mix is not traditionally Middle Eastern, the leafy green is a common dip ingredient mixed with sour cream or with artichokes and Parmesan cheese. And since hummus is often served as an appetizer dip for veggies and pita bread, adding the spinach makes it an interesting variation on classic American spinach dip. It also bumps up the nutrition content, along with the high fiber chickpeas. Spinach contains plenty of potassium, magnesium and vitamins without adding much in the way of calories. But don't worry, this tastes so good that nobody will know it's also good for them. In a food processor, process the garbanzo beans, minced garlic, chopped fresh spinach, tahini, and olive oil. Add the lemon juice and salt and blend until thoroughly smooth. If your spinach hummus is too thick, try adding a tablespoon of water at a time until it is your desired consistency. The finished hummus should be smooth and creamy. Spinach hummus can be made up to two days in advance. It can be served hot or cold. Serve with pita bread, pita chips, or fresh veggies.